In October, I was fortunate enough to attend the 2017 Online News Association conference as a speaker. 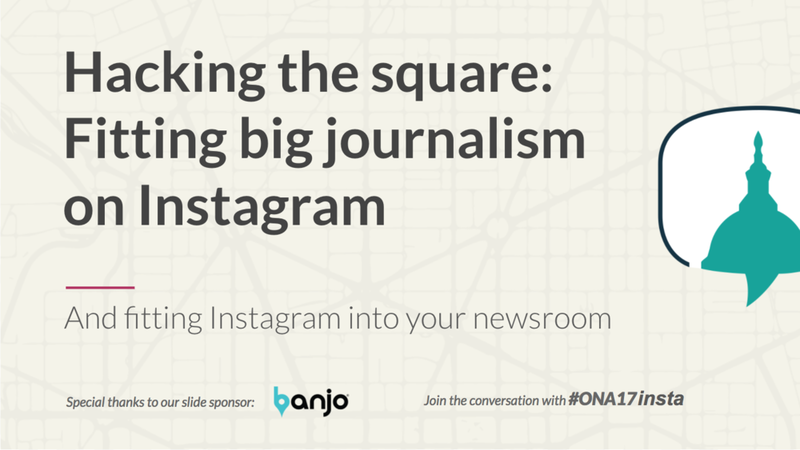 My session, Hacking the Square: Fitting Big Journalism on Instagram, was designed to demonstrate how The Globe dramatically changed our approach to Instagram in late 2016 and early 2017, and the huge gains we saw as a result of those changes. The presentation begins with why your newsroom should be using Instagram and moves on to offer concrete tips for getting your newsroom to integrate the platform into daily workflow and priorities. I also provide a number of examples of how we fit some of The Globe's award-winning journalism on the platform. A small clip from my ONA17 session on fitting big news on Instagram.